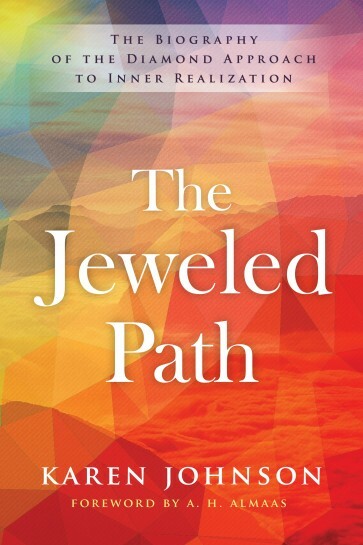 The Jeweled Path invites you to enter into the story of how the modern spiritual path of the Diamond Approach emerged. With humor and intimacy, Karen Johnson, cofounder with A. H. Almaas, reveals the personal experiences that birthed the teaching and furthered its development. These profound awakenings—occurring amidst ordinary life—became the building blocks of a remarkable new approach to human nature and to our understanding of reality. Learn more about upcoming book talks on the public events page. Available at Shambhala Publications or most book retailers. "For anyone interested in the origins of the marvelous Diamond Approach, here it is. Karen offers an inside glimpse into the DA founders’ passion, truth seeking, and wisdom—a journey that can inspire your own." "A humble, honest, intimate, lucid, and above all astonishing account of the rise of a remarkable teaching. It’s good to find confirmation here that even pure diamonds don’t fall ready-made from the sky; they must be ground and polished in the crucible of the human heart. Karen’s and Hameed’s four-decade journey of unflinchingly honest and deeply mutual discovery sets a new benchmark in our appreciation of the full potential of spiritual friendship." "A rare, intimate dive into the development of a spiritual path. We don’t usually have the opportunity to witness the birth of a path from the perspective of one who is engaged with its development. Nor are we often invited into the lives of its founders as they awaken to the teaching that is emerging through them. Through Karen Johnson’s writing, her humor, her keen-eyed observations, her willingness to reveal her humanness, and her ever-cascading realization, we are able to hear the untold story of the Diamond Approach and experience its profound gifts in a new way. What a privilege."